In economics, the theory that for each additional unit of a product an individual consumes, the less utility or satisfaction the person derives from it. This is important to determining how much supply of a product the market can handle without diminishing demand. Historically, it has been thought that one can quantify the marginal utility of each unit, but some economists disagree with this. See also: Austrian school. Fig. 45 Diminishing marginal utility. To a hungry man the utility of the first slice of bread consumed will be high (Oa) but as his appetite becomes satiated, successive slices of bread yield smaller and smaller amounts of satisfaction; for example, the fifth slice of bread yields only Ob of additional utility. a principle that states that as an individual consumes a greater quantity of a product in a particular time period, the extra satisfaction (UTILITY) derived from each additional unit will progressively fall as the individual becomes satiated with the product. See Fig. 45 . The principle of diminishing MARGINAL UTILITY can be used to explain why DEMAND CURVES for most products are downward sloping, since if individuals derive less satisfaction from successive units of the product they will only be prepared to pay a lower price for each unit. Demand analysis can be conducted only in terms of diminishing marginal utility if CARDINAL UTILITY measurement is possible. In practice, it is not possible to measure utility precisely in this way, so demand curves are now generally constructed from INDIFFERENCE CURVES, which are based upon ORDINAL UTILITY. See CONSUMER EQUILIBRIUM, REVEALED PREFERENCE. The methodological basis of the argument if applied to the existence of diminishing marginal utility of one rational individual is relatively uncontroversial, but if applied to a group and/or society, there are long-recognized and unsolved issues of allowing interpersonal comparisons of utility, and these issues are even compounded in the intertemporal and/or intergenerational context. Thus, diminishing marginal utility does not provide a general acceptable justification for discounting. Certainly it is difficult to take happiness research and experiments on loss aversion seriously while remaining convinced that diminishing marginal utility of income provides a solid justification for government transfers. Given that the problems with making interpersonal comparisons of utility are clearly being ignored by those using diminishing marginal utility of income to argue for income transfers from the rich to the poor, I feel justified in making the same comparisons in pointing out a flaw in their argument. 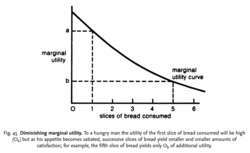 In the single-constraint case, the combination of additive utility and diminishing marginal utility for all goods implies that all goods are normal. However, the negative substitution effect in (12) means that while these conditions - along with additivity and diminishing marginal utility - do imply that S is inferior, they do not imply that S must be Giffen. The principle of diminishing marginal utility helps us understand another economic principle: the law of demand. The challenge is to find language that clarifies the meaning of diminishing marginal utility at the same time preserving the concept of margin. 14) This welfare function is presumed strictly quasi-concave with diminishing marginal utility of industry support as expected benefit increases (|M. s~, assuming diminishing marginal utility of wealth, it follows that |Mathematical Expression Omitted~. 40) and Piero Sraffa (1998 ) referred to the formal similarity between the diminishing marginal utility and marginal productivity theories.